At forty-nine I’m relatively fit. I can hike a peak, cycle hard, run and I do yoga everyday but what Roll does, and continues to do, is beyond what most of would even consider an option. How about five Ironman length triathlons in seven days? If you are like me, someone who would probably not survive the first leg of the first day, then it might be difficult to even contemplate what Roll is doing. What I like about Roll is that he’s a living testament to the fringe of what is possible, but the most difficult and important thing he’s even done, by far, is get clean. The rest of his achievements, gravy. After more than four years of sickness with Lyme, I’m pretty sure now I will never fully recover. This is not to say that others won’t. I’ve met plenty of people who feel like they are “fully beyond” Lyme, but many of these folks aren’t nearly as active, found treatment much sooner, had more robust immune systems or had a differing set of coinfections. Lyme is a unique riddle. Me, I’m learning to deal with being in a world of constantly fluctuating health, and a world that people just simply don’t want to know about. For me personally, the most important part of this book is the recipe section at the back. So many great things here, especially when it comes to specifics for pre, during and post exercise nutrition. Here is today’s ride, which for me is a good solid ride, while for a guy like Rich would be a warmup to the warmup. But I’m happy with the progress so far. And I did utilize some of the nutrition information I gleamed from the book, AND ended up sharing with my riding mate as he was in need about halfway through. The fitness industry is filled with so many perversely phony, narcissistic tools living obnoxious lives via Instagram, but Roll seems to fly above the chatter. He just explains what he does and lets you decide who you really are and what you are ready to do. Finally, one aspect I loved is he describes being asked countless questions in regard to his kit. “Hey, what kind of GPS watch do you wear?” kind of thing, and he responds by NOT responding with an answer because IT DOESN’T F^%$%$# MATTER WHAT KIND OF GPS WATCH HE WEARS. I get this ALL the time with photography. “Hey, why do you use the Zupperflex 5000 when you could have bought the Zupperflex 5001?” Or the analog vs digital debate. Or what type of bag, strap, flash card, lens, etc. etc. Now, full disclosure. Less than a week ago I ate a bacon wrapped sausage. I did. No denying it. But, it was at a party and three huge Samoan guys kept saying “Dan, eat this.” “Dan, you need this.” “Dan you are too skinny.” Was it delicious? Yes. Did I feel bad about eating it? No. But what this means is it entirely rules out me ever writing a book like this, which means all of you are spared. Roll deserves A LOT of credit for this journey and the fact he’s helped countless people find their own path to recovery, fitness or both. 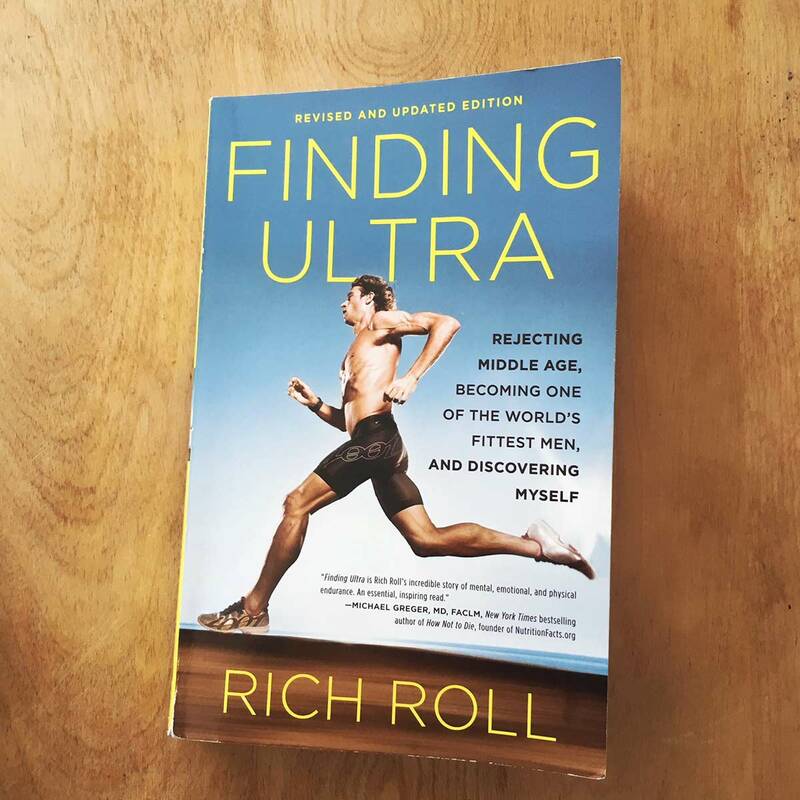 If you are interested in being human, fitness, diet and one man’s story of endurance then check this baby out. Sounds like quite an incredible story, and being interested in all those things you mention, I will check it out! And love your Reviews! Thanks. Bacon is the great equalizer. Nothing like a Samoan guy to make one feel like the runt of the litter. It was a wall of Samoan and they knew how to cook. I’m having positive flashbacks. I think I need to read this if for no other reason than to reject middle age, although in reality, I’ve think I’ve passed that milestone. Nonetheless, looks like a good book to consider. The recipes in the back are solid, and tasty. Eat this way consistently for two weeks and it will change your life. Same for doing yoga.